Mindfulness For The Christian Leader: It’s Not What You Think! Warning! It Is not my intent to make anyone mad. If you are not a Bible believing Christian, do not read further. It will only make you mad. If you are a Bible believing Christian leader, it is urgent you read this. Mindfulness is all the rage. It is touted as the panacea for much of what ails leadership and management, even humankind in general. National magazines praise its virtues from the shop floor to the boardroom. A major component of mindfulness is meditation. Merriam Webster defines meditation as “to engage in contemplation or reflection; to engage in mental exercise (as concentration on one’s breathing or repetition of a mantra) for the purpose of reaching a heightened level of spiritual awareness. 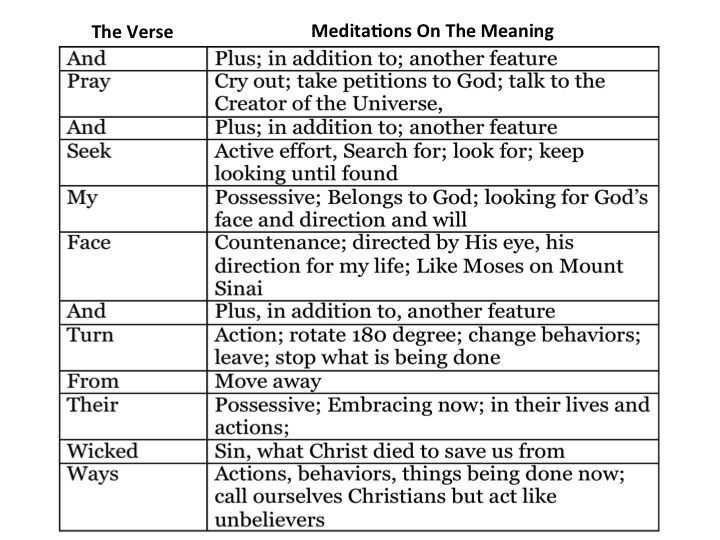 For centuries the Bible has instructed believers that meditating is essential for the believer. This is not a new phenomenon. It is a part of the believer growing in grace and learning how to behave consistently with the Word of God. 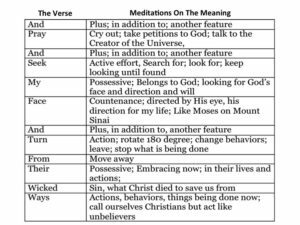 What Are The Elements of Christian Meditation? Biblical meditation is very different, in fact opposite, from the meditation espoused by the current mindfulness movement. The Bible teaches that meditation is to be an ongoing practice. David writes in Psalm 1, “Blessed is the man that walks not in the counsel of the ungodly, nor stands in the way of sinners, nor sits in the seat of the scornful. But his delight is in the law of the Lord; and in his law does he meditate day and night.” Meditation on God’s Word is to be the Christian’s way of life. The key distinction between Christian medication and mindfulness meditation is what is being meditated upon. For the believer, it is not the act of meditation that creates success but rather the source of what is being meditated upon. Christians know our country is moving in an increasingly downward path. We live in a time where right and wrong are often reversed. In the workplace, leaders are asked to do things that are wrong or inconsistent with Biblical truth. The need for meditation on God’s Word is needed more than ever. Christian leaders need God’s wisdom in how to live and lead in today’s world. As John McArthur writes, “Meditation is no less needed today. We live in a culture that continually assaults us with distractions through billboards, television, the Internet, and more. God says that we should keep His Word perpetually in front of our eyes, filling our minds and conversations wherever we go.” http://www.gty.org/blog/B141110/meditation-that-honors-god?Term=meditation. Scriptural meditation is not mindless or the humming of nonsense words or even pondering random thoughts that might fleet into one’s mind. It is not observing one behavior from afar without judgment. 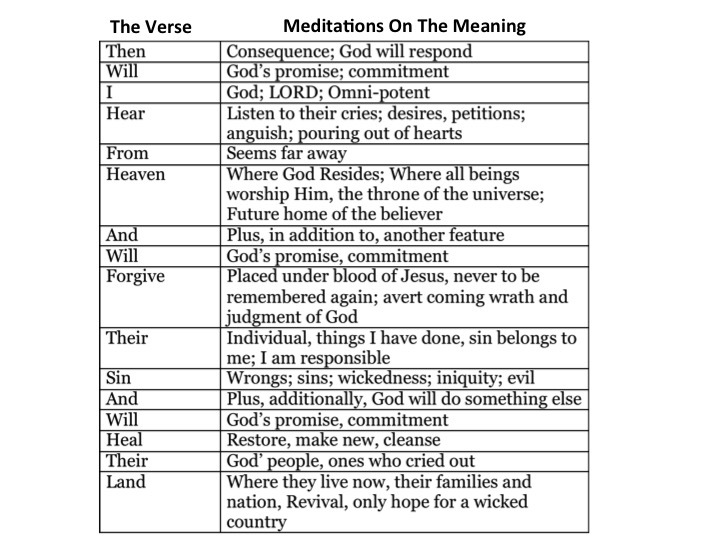 The purpose of Biblical meditation is to transform the believer’s mind by meditating on the Words of God. Romans 12:1 instructs, “Do not conform to the pattern of this world, but be transformed by the renewing of your mind. Then you will be able to test and approve what God’s will is–his good, pleasing and perfect will.” In other words, the purpose of meditation for a Christian is to renew one mind by focusing on God’s Word that leads one to know God’s will and then do it. How to meditate is illustrated through the example of a cow or camel chewing its cud. The cow will chew grass and turn the grass into a ball by moistening it. The cow then swallows the cud, and stores it in one of the sections of its stomach. Later the cow will retrieve the cud and continue to chew and digest it. This happens several times until the cud is fully digested. This illustration from nature shows us the Christian approach to meditation. The Christian memorizes and reads God’s Word. Then, like the cow, the Christian will pull a verse out of his or her memory (or their reading), rolling it over in their minds ad contemplating its meaning. 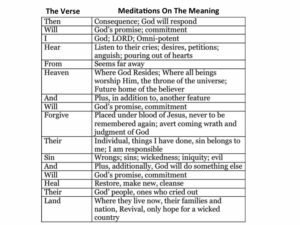 This involves asking the question “What is God saying in this verse?” Repeated meditation on a verse will reveal new and different insights and applications of the truths presented. Therein, according to scripture, lies the renewing of the mind, the development of wisdom and the path to great success from God’s perspective. Meditation is especially important for the Christian leader who wants to lead and mange people according to the principles found in the Word Of God. We know from scripture that G the Christian leader is held to a higher level of accountability. If the Christian leader wants to be an authentic example of Biblical leadership, it requires knowing and practicing Biblical principles. This means applying Biblical principles to real life situations and that requires wisdom. 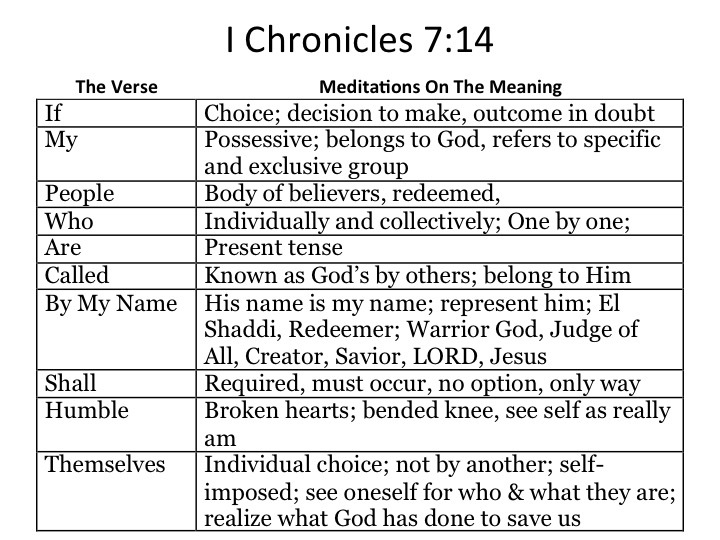 How one meditates on scripture verses can take different forms. Here is an example of what that process might look like. These are my ponderings as I thought about what this verse means to my life and me. Other Christian’s meditations on this verse will be different. What is the same is the Word of God – the source of the meditation. How Does Meditation Help The Christian Leader? It is easy to get caught up in the fads and teachings and advice of the day (Psalm1:1). It is easy to rationalize actions that are inconsistent with scripture. It is easy to believe that true leadership wisdom comes from secular authors or the advice of friends or peers. But Christian leaders are to “test” their leadership actions against the Word Of God. They must be careful not to fall into the trap of wisdom that has “a form of godliness but denies the power thereof”. (II Timothy 3:5). So How Does A Christian Leader Start? 1. Read and scripture daily. As you read scripture select verses to meditate upon. 2. Ask for God’s blessing and guidance as you meditate on His Word. 3. Set aside time in the day to meditate on specific verses. (Doing this in the morning as one prepares for work or when one goes to bed are two valuable times). This is why memorizing scripture aids in meditation – one can meditate as they get ready in the morning, drive to work or lie down to sleep. 4. As situations come up that test one’s emotions, meditate on specific verses. One leader I know had a problem with anger. When he felt himself get into a situation where he started to lose it, he memorized and would meditate on James 1:19, “Everyone should be quick to listen, slow to speak and slow to become angry”. 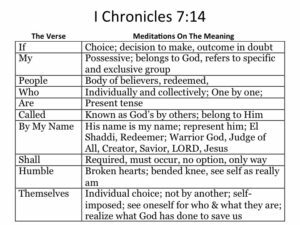 If Christian leaders have a certain part of their life that hinders their ability to lead, they should select specific verses that address that area and begin meditation there. 5. Live your life and lead your people according to the Word of God. As He renews your mind and provides guidance for your actions through His Word, the leader will see God’s blessings on obedience to Him. But obedience to God does not always lead tp public applause. It is important to remember that ultimately praise and recognition for meditation and obedience to the Word of God will come from God, not from the applause of others. For Christians and Christian leaders this is the path of Biblical mindfulness that God promises to bless and which will lead to great success.